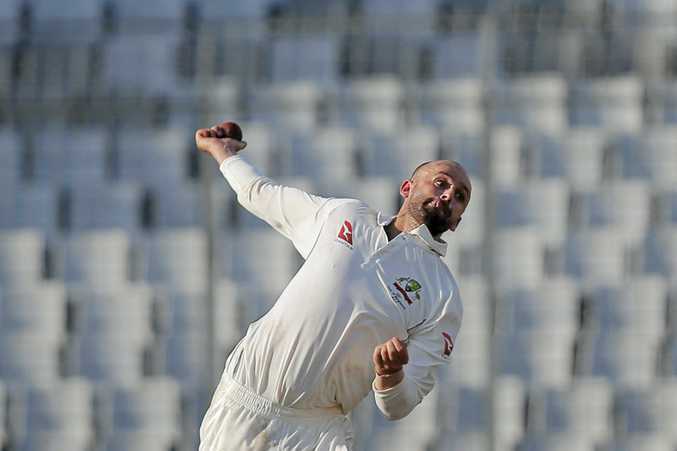 NATHAN Lyon produced an amazing spell of spin bowling to leave Australia unexpectedly in charge of the second Test against Pakistan after the opening session in Abu Dhabi. Pakistan seemed to be in cruise control as they reached 1-57 midway through the first session before Lyon changed the complexion of the game with three wickets in four balls and then four wickets in six balls without conceding a run on Tuesday as Pakistan ended the session at 5-77. Lyon put an end to a 52-run second-wicket stand when he caught Azhar Ali (15) off his own bowling. He followed that up by immediately removing Haris Sohail (0), caught at silly point, before Asad Shafiq survived the hat-trick ball. Shafiq did not survive much longer though, caught at bat-pad on review on the next delivery for zero. Two balls later Babar Azam charged the spinner only to have his stumps pegged back to depart for a duck. Lyon's heroics mean he went past Brett Lee (310 at 30.81) and Mitchell Johnson (313 at 28.40) to fourth on Australia's all-time Test wicket-taking list, behind only Dennis Lillee (355 at 23.92), Glenn McGrath (517 at 21.64) and Shane Warne (708 at 25.41). Lyon has taken 314 across 80 Tests. WATCH EVERY BALL LIVE ON FOX CRICKET. It's cricket like never before. Every Australia home Test, ODI, T20I Match LIVE and ad-break free. SIGN UP TODAY!